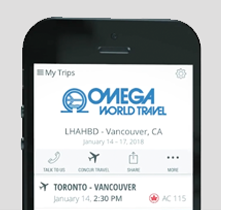 October 25, 2018: Fairfax, Virginia – Omega World Travel recently went mobile, with the release of the Omega Go App. Omega Go connects to clients’ online booking tools such as Concur Travel, Amadeus Cytric, and Sabre’s GetThere sites. Not only will the traveler be able to instantly connect to their Omega booking agent, the traveler will be able to look up their current, upcoming and past itineraries. While on the go, the traveler will be able to check their flight status, check-in for flights, view airport maps and even check the weather for their destination in real-time. Omega has partnered with mTrip, a leader in mobile apps, to integrate with services like Lyft and Uber. Omega Go also offers an option that allows for GPS-based tracking. If the traveler turns on the GPS function, the travel manager will be able to track their traveler, during an emergency such as a hurricane or other natural disasters. Furthermore, when the traveler arrives at the desired destination, Omega Go can provide a plethora of destination info., i.e. restaurants, things to do including tours, restaurants, and other entertainment options. Omega Go is your immediate connection to your travel advisor, and beyond when you’re on the move!